Welcome! My name is Becka Sheranian and I’ve been learning about plants and plant ways since I was a kid growing up in the 60’s. I was drawn to plants and wanted to know all about them. My first ‘teachers’ were my neighbors who had the most magical garden. Every day to and from school I would stop and look in through the fence at the glory of it all. One day, they invited me in and that was my first formal lesson. They taught be about flowers and herbs and how to use them and grow them. Then one day, much to my parents chagrin, I begged them to let me use a bit of the backyard for my own garden. By that summer we were eating several of our own veggies out of the backyard, I was hooked! When I left home I moved to the mountains of Sonoma and Humboldt counties and bounced back and forth between the two. They were wonderful places to live off the land and learn more about plants. Then I was called to Midwifery. In those days, the 70’s, there were few teachers of the trade and so we created study groups among those of us interested, traveled to lectures and conferences together and did all we could to become self-taught. Along the way I blended the two things I enjoyed most, plants and babies. 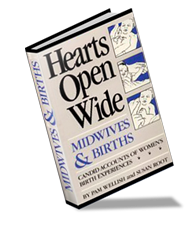 Some of my early teachers include the midwives that I had the honor to apprentice with, Nancy Mills and Joan Lashbrook (now Logan) in Sonoma county. And all the wonderful holders of knowledge that would come share with us at our apprentice study group: Rosemary Gladstar, Don Solomon, Yeshi Newmann, Gail Peterson, Lewis Mehl and so many others. Whenever possible I’d travel down to Santa Cruz and attend workshops offered at the Santa Cruz Birth Center and soak in the knowledge of Raven Lang, Kate Bowland, Karen Erlich and other early holders of midwifery and herb lore. It has been a full circle to land back in Sonoma county, and a wonderful journey with midwives and herbalists sharing along the way. I invite you to come join in! I’ve been teaching now for over 35 years. I like to provide practical how-to information that you can take with you and use in your daily lives. Most classes are taught by me, however there are several classes throughout the year that are led by talented and knowledgable guest teachers that are herbalists, midwives, doulas, aroma therapists, energy healers and those with all kinds of talents. 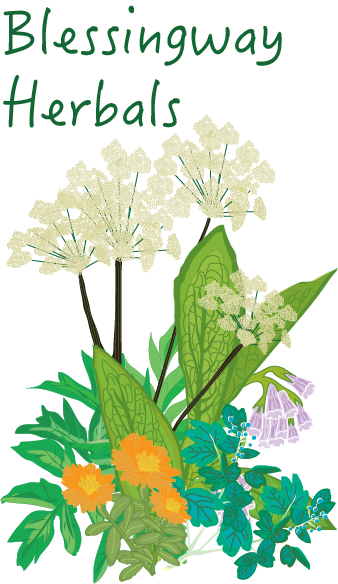 I currently am a guest teacher for California School of Herbal Studies, The Fall Gather and the lively Northern California Women’s Symposium. In the past I’ve taught classes at the Sonoma County Herbal Exchange, Bay Area Herbal Conference, Asilomar, Rosemary’s Garden, Moonrise Herbs, Sonoma County Herbal Festival, Heartwood Institute, Institute for Sustainable Agriculture, KPFA Radio plus numerous birthing & herbal events and conferences. In the mid-1970’s I attended the The Institute de Allende in Mexico for a month to learn about plant dyes and traditional medicine. After completing that course I headed to Guatemala. During my time there a huge Earthquake happened. I met some of the Farm’s Plenty folks, who were down there teaching sustainable water systems to villager and who had started to help out with the rebuilding effort after the quake. They told me that the Farm was going to start offering intensives on sustainability and that Ina May would be doing some on birthing. That grabbed my attention, and when I got back to the states some sister apprentice midwives and I signed up for for her intensive. We headed to Tennessee, by way of El Paso’s Maternidad La Luz midwifery school, where we spent a few months in training before heading out to the Farm intensive. Back in California the political scene around homebirth had heated up. Midwives had started to be arrested and several in the state were threatened. It was time to act. California Association of Midwives (CAM) was formed and Sonoma county midwives organized. 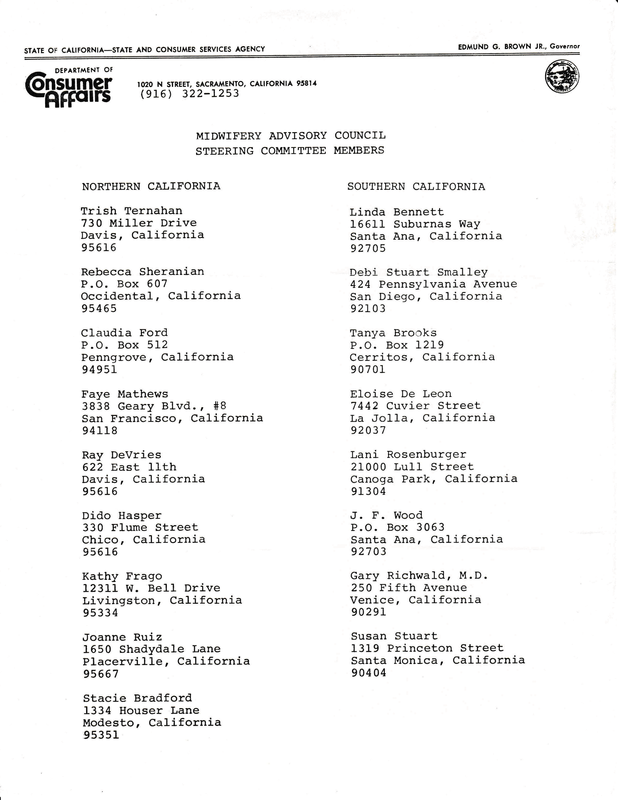 As an early member of CAM I sat on Governor Brown’s Midwifery Advisory Council. I served from 1980-1983, and collectively with other council members, CAM and many State representatives who supported us, worked together to help bring legalization of Midwifery closer in the state of California. If you’d like to learn more about the early efforts to legalize midwifery in California, CAM, and the creation of the Midwifery Advisory Council, Read More Here. 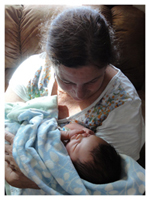 Story of Homebirths in Rural & Mountainous Humboldt county. Becka is one of seven amazing midwives showcased in this book. She and the other midwifes tell remarkable stories about birthing in rural Humboldt county, and their calls to midwifery.